Andrew is the Managing Director of Valera Pastoral Company, a mixed sheep/wheat family-controlled business that has maintained a traditional balance between cropping and livestock enterprises. He is also the Principal of the Trigger Vale Maternal Poll Merino and Terminal White Suffolk studs, which maximise genetic gain and client profitability by performance testing using MLA's LAMBPLAN and MERINOSELECT genetic evaluation technologies. Andrew has a Bachelor of Agricultural Economics from the University of New England and is a graduate of the Duchy College Challenges of Rural Leadership Course held in the United Kingdom in 2009. He currently sits on the Board and is Deputy Chairman of Southern Agventure which has over 270 farmer shareholders. The goal of the company is to identify opportunities and bring to life commercial business models so farmers and the broader local community can retain a higher proportion of Agricultures post farm gate supply chain profits. The company's first joint venture in conjunction with Emerald Group Australia is Southern Ag Grain which is a successful grain marketing company based in Wagga Wagga. 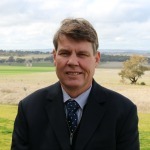 In July 2012 Andrew has also been appointed to the Southern Ag Grain Board. During a Nuffield Scholarship completed in 2006, Andrew investigated how to fully utilise and rapidly improve the Australian maternal ewe flock (including Merinos) to ensure continuity of supply to Australia's valuable meat and wool markets. Over the past 25 years, Andrew has been an active member of numerous industry boards and organisations including the Sheep Genetics Advisory Board, Rutherglen sheep CRC Advisory group and on the Executive for the Superwhites Young Sire Evaluation Program. In 2010 he participated and completed the Australian Institute of Company Directors course.